With plant stanols. Proven to lower cholesterol. Free from artificial colours and flavours. Over 30% less calories than Benecol buttery taste spread. Suitable for vegetarians. Plant stanol ester has been shown to lower cholesterol. High cholesterol is a risk factor in the development of coronary heart disease. A daily intake of 1.5-2.4g plant stanols lowers cholesterol by 7-10% in 2-3 weeks. Consume 3 servings daily (2g of plant stanols) to give you the effect as part of a healthy diet and lifestyle, including your '5 a day'. 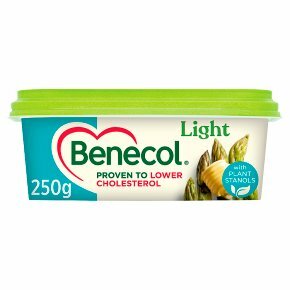 This Benecol® spread contains plant stanols shown to lower cholesterol by 7-10%. Enjoying 3 servings daily can make your foods do more for you by keeping your heart happy too. Our Light One A smart and tasty choice to embrace the lighter side of life. Perfect for spreading lavishly on bread or melt into your favourite vegetables.